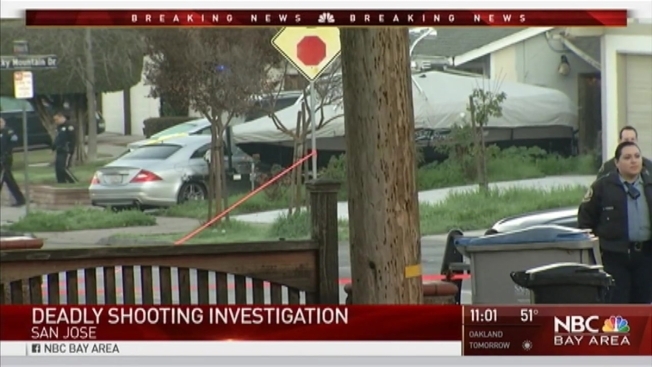 A man driving his car Friday morning near an elementary school in San Jose was shot and killed, according to police. Police said the homicide occurred around 6:30 a.m. on the 1600 block of Mount Pleasant Road, which is near the Robert Sanders Elementary School. A spokesperson said the school was not impacted by the shooting, and the school adhered to its regular routine. The victim, who was driving in a silver Mercedes, was shot at least once while he has driving in front of the school. He then crashed into a nearby car parked on a driveway. Police said the victim was pronounced dead at the scene. Friday's homicide was the South Bay city's third homicide of 2017. San Jose recorded its deadlist year in more than a decade during the 2016 calendar year. "It's very important more so now than ever that the police department and our community band together to try and come up with solutions on how we can go ahead and address some of the issues of violence in our communities," Albert Morales from the San Jose Police Department said. "Once we do that, then hopefully we can see those decreases start to happen." A motive regarding Friday's act of violence has not been made known at this time, and no suspects have been identified or detained, according to police. Anyone with information is asked to contact the San Jose Police Department's Homicide Unit at 408-277-5283. Those wishing to remain anonymous should call Crime Stoppers at 408-947-7867.